One way to get creative with the kids is by painting rocks. Start by taking kids on a walk to select the perfect rocks to paint. The walk and the fun of finding just the right shape rock will be an adventure for little ones. Next, decide on your design and where you want to paint rocks at. Be sure to protect the area and the kids clothing from any spills that may happen! Gather up your paints and paint brushes and any other material you may want to use to create your works of art. 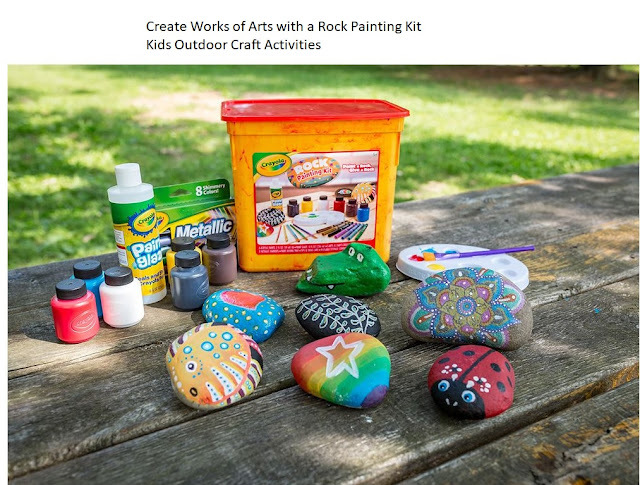 We suggest using the Crayola Rock Painting Set because it provides you with everything you need in order to paint your rocks and turn them into the perfect work of art. 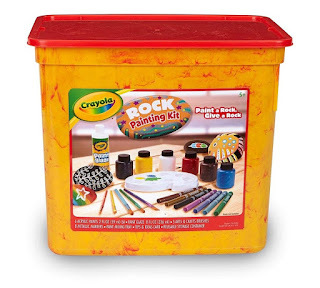 It includes six 2-ounce Acrylic Paint bottles (red, black, yellow, white, blue, brown), an 8-ounce Crayola Paint Glaze bottle, 5 arts & crafts brushes in variety of sizes, 8 Crayola Metallic Markers, a paint mixing tray, and a tips & tricks card all in a reusable tub. Designs can range from animals, rainbows, bugs, flowers,doodles, add your favorite saying to a rock or any pattern that you choose. Once the rocks have been painted be sure to share them with friends, make a few gifts for family members, or make colorful decorations just for the fun of playing with rocks and turning them into artwork! Pick your favorite color and paint the rock one solid color or use multiple colors to create the perfect designs. Start a collection of rocks that you have painted and keep them in a storage container or display them on a shelf for others to see. 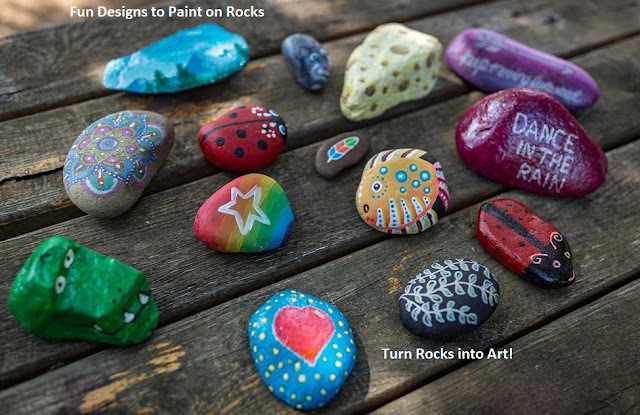 These rocks can become works of art especially for the kids. A kids creativity and imagination is easily taken to another place when they decide on what shape of rock they want to use and how they want to turn it into a creature, bug, animal or just draw different colors on the rocks. The final finished project becomes something that kids will enjoy doing past the summer months. There are also lots of other creative arts and craft activities for the kids enjoy outdoors from drawing with chalk to sand art and more! Encourage children to get outside and enjoy the sun and fresh air! Check out our Amazon Store for More Creative Ideas!